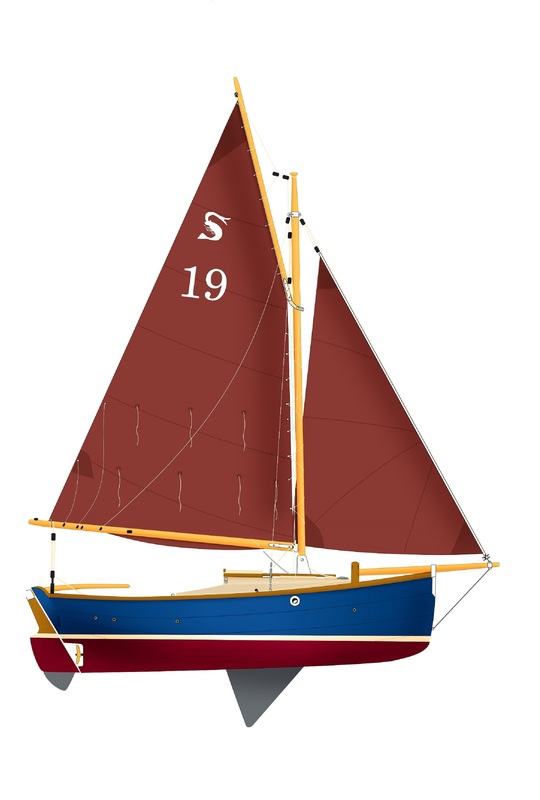 The Cornish Shrimper 19 is our most popular model with classic styling that appeals to sailors from any generation and a build quality that has led to her reputation as the best British production Gaffer of all time. 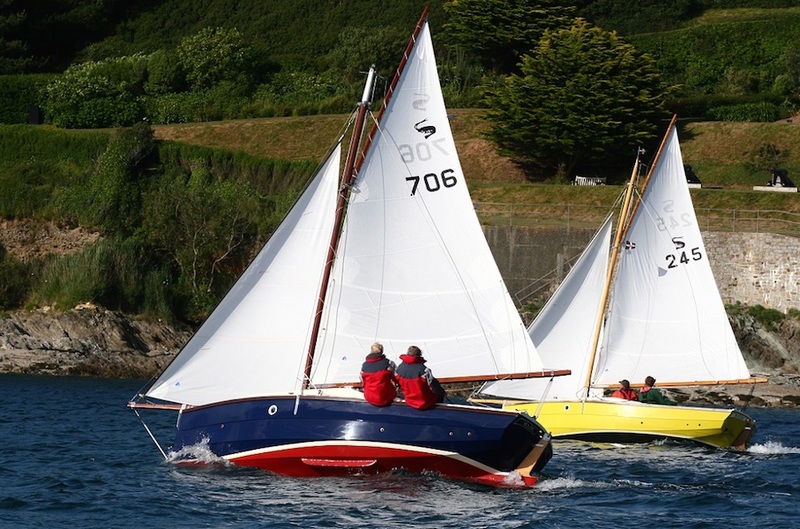 We have built over 1100 Cornish Shrimpers since 1979 with the original boats still being sailed all over the world. Unusually for a boat of this size the standard outboard engine version can be upgraded to take a Yanmar 9hp inboard Diesel. 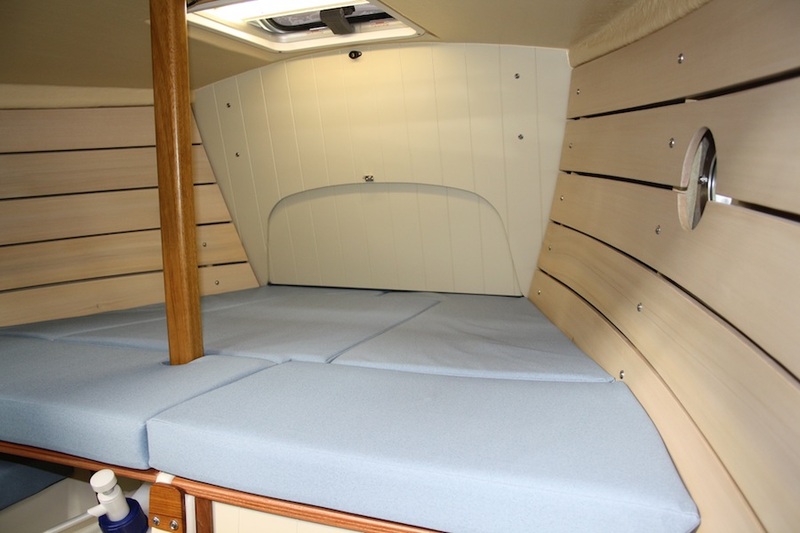 This sets her apart from the other trailer sailors on the market. 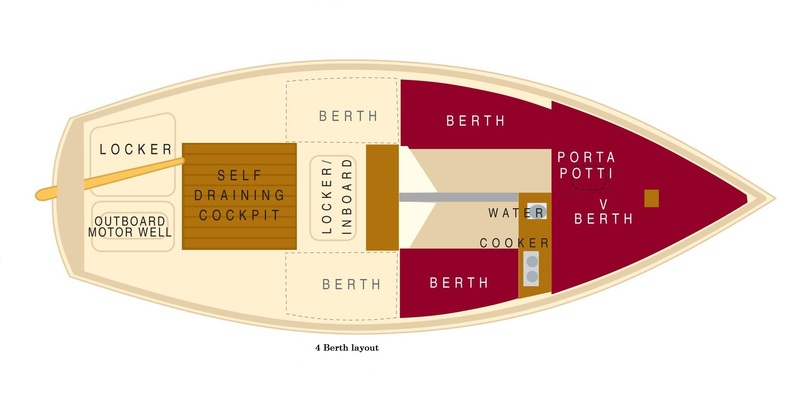 The self-draining cockpit is roomy compared to other boats of her size and the companionway leads down to either a classic 2 berth arrangement or modern 4 berth layout with space for a sea toilet if required. 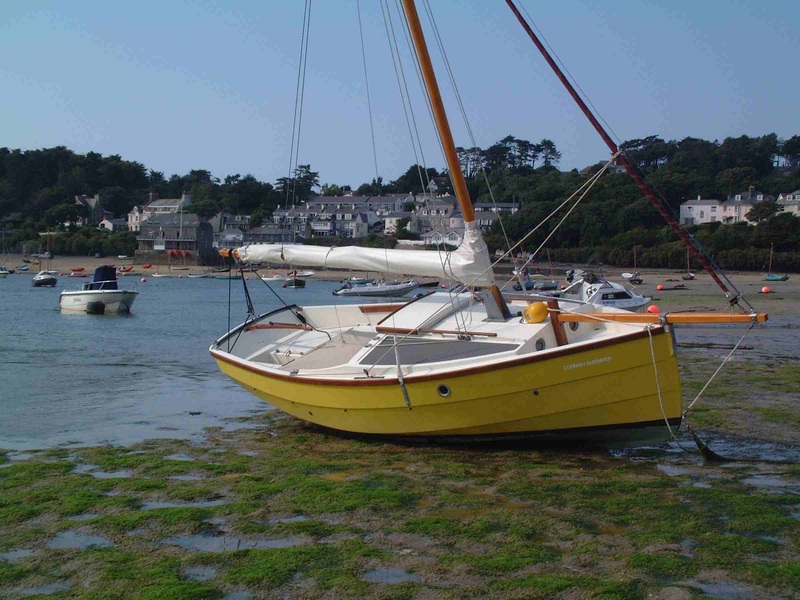 A shallow 1’ 6” draught and lifting keel allow for sailing to tranquil coves &amp; creeks taking the ground around a tide with ease. 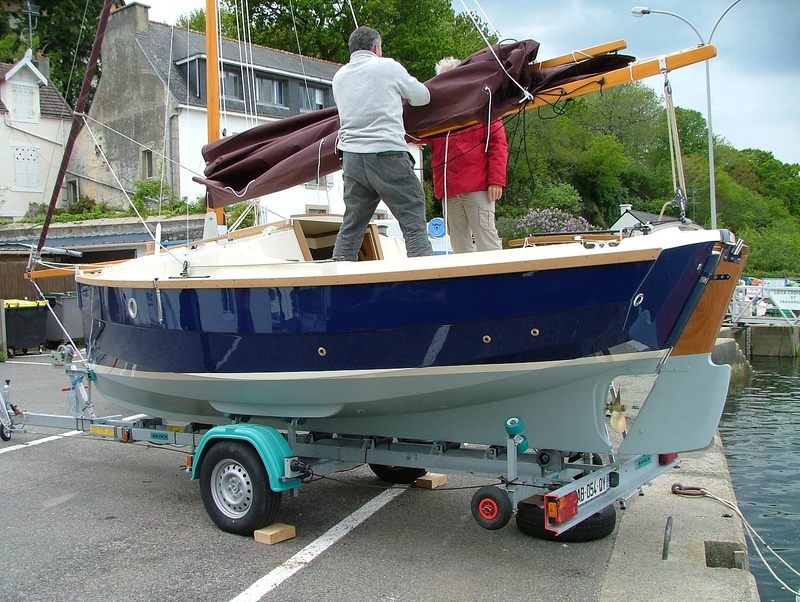 Launch and retrieval is done without difficulty from a single axle trailer with the pivoting bowsprit arrangement making mast lifting safe and easy. "Nous l'avons eu pendant 6 ans, traînait & amp; son navigué en Hollande & amp; France. " or dark green. The hull and deck joint is by way of an overlap or ‘Biscuit Tin Lid’ with GRP bonding. from laminated plywood with a stainless steel lifting drop plate. with a stainless steel lifting wire leading to a winch lifting system operated from the cockpit. winch to starboard. Adjustable jib &amp; mainsheet cars. 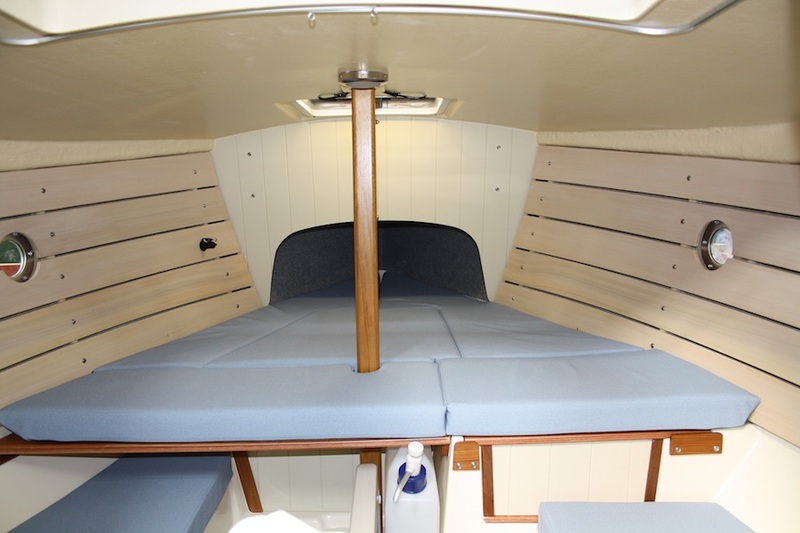 Access below is via a teak lined sliding companionway hatch and split plywood / Perspex washboards. Extra ventilation provided by an aluminium forward hatch. Ports: 2 aluminium fixed ports are fitted one each in the hull topsides. Miscellaneous Equipment: Fuel filler &amp;tank vent. (Inboard version only), Life harness attachment point by the companionway, Rope tidies for halyards. Cockpit Lockers: Two main watertight lockers with latches and padlocks are provided. 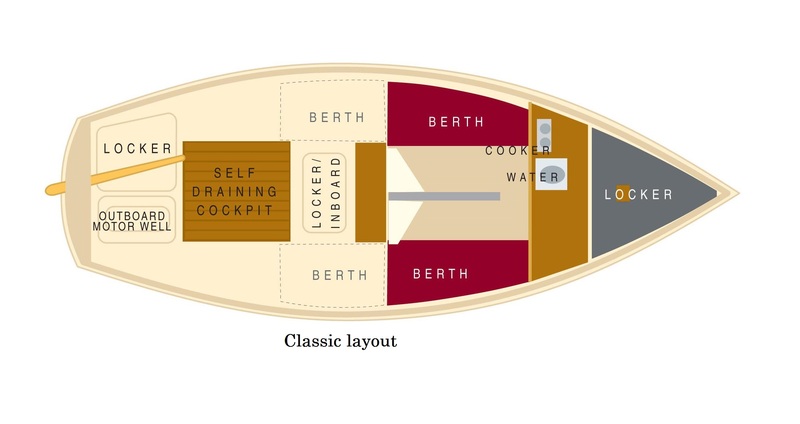 A padlock is also provided for the companionway hatch. 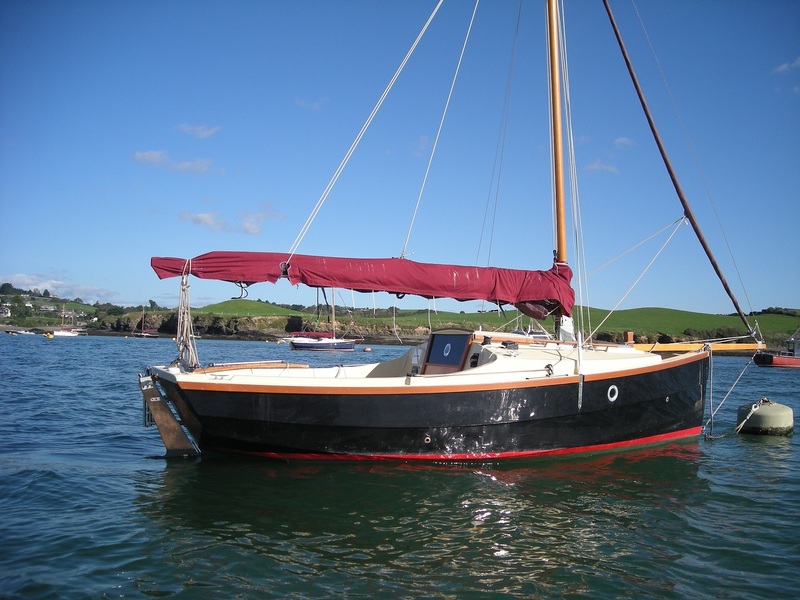 Mainmast: Laminated in Sitka Spruce and treated with Sikkens Cetol including a stainless steel mast band to take Cap shrouds, jib and mainsail halyards. All deck mounted on a substantial stainless steel tabernacle. associated reefing line leads / terminals. Bowsprit: Laminated in Sitka Spruce and treated with Sikkens Cetol including a Stainless steel pivot fitting, end plate and bobstay take off points. reefing spar and controls led aft to cockpit. 6mm braid. Mainsail outhaul – 6mm braid. Mainsheet &amp; Jib sheets – 10mm sheet rope. All associated blocks for purchase tackles. 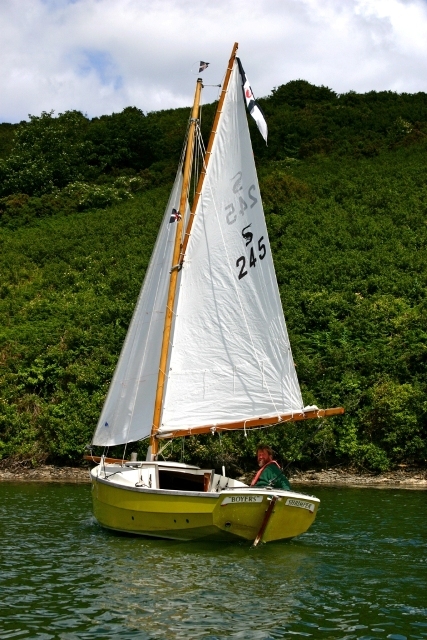 Mainsail: Dacron in tan or cream. 2 reef points with tie in lacing. Luff and gaff lacing as required. Engine: Yanmar 1GM10 9hp marine diesel engine. A 55 amp (12V) alternator is fitted to the engine. include audible alarm, alternator warning light, start switch and stop control. A single lever engine control is supplied and fitted in the cockpit well. discharges overboard through the exhaust. lines, the flow line having a manual shut off valve. Fresh Water Tanks: 2 x 10ltr plastic jerry cans with manual hand pump. Also a bucket / sink. Inlet / Outlet Fittings: Engine: In through a single skin fitting with a valve and strainer, out via the exhaust system. Gas System: There is a double burner hob cooker attached to a separately stored gas bottle. 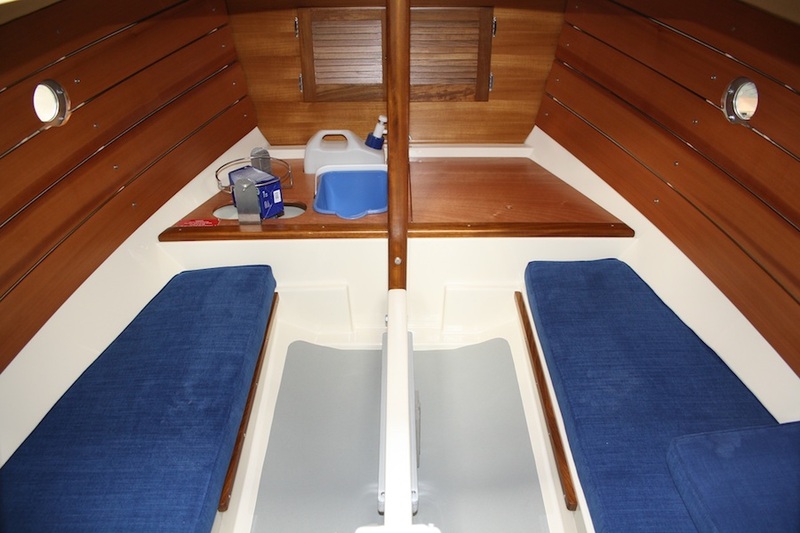 Finish: All cabin woodwork is finished in a mix of painted bulkheads and varnished trim. Soles: Rubber textured sole throughout.